The Gloss Collection from Urbia combines clean lines with high style to create a fresh contemporary look. Exhibiting rich fabric and leather choices, high gloss lacquers, tempered glass and powder coated metal accents, the result is a uniquely inspiring and stunning collaboration. 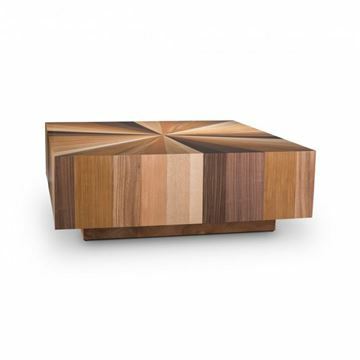 The collection comprises an assortment of dining tables, buffets, entertainment consoles, cabinets, and chairs. IE Series, inspired by mid-century modernism, the IE Series stands for clean design and simplistic functionality. With woods from all over the world and slightly indigenous silhouettes, the design of each piece is timeless yet distinct. MIXX Collection, decidedly different from our handsome hardwoods, the MIXX Collection of indoor / outdoor furniture features designs with industrial appeal. 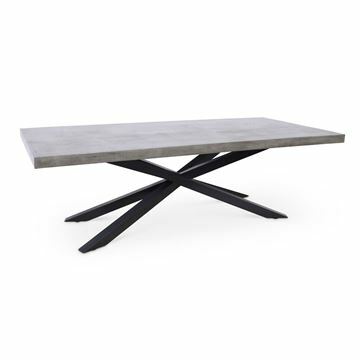 Made from a special blend of fiber-reinforced concrete, these pieces are both handsome and built to last. Naturals Collection, consists of extraordinary handcrafted furniture made from reclaimed hardwoods and plantation grown resources. 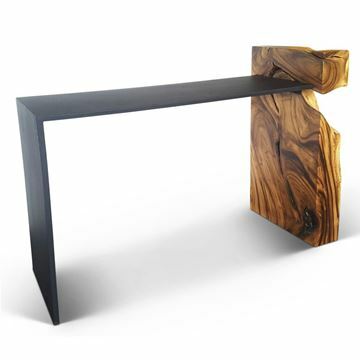 The collection includes one of a kind dining and occasional tables, console tables, sideboards, and unique home accent pieces. Nova Collection, comprises intelligently balanced designs that appeal to those that are distinctively stylish. Often bright and bold, the items in the collection are both memorable and functional - sure to leave a lasting impression. Toccare Upholstery, representing the softer side of Urbia. The Toccare Collection is bold, distinctive, and stylish. Available in over 100 rich upholstery and leathers, each piece brings its unique contemporary styling in a sofa, sectional, occasional chair, chaise, and ottoman frame. The Hunter Dining Table by Urbia. Crafted in fiber reinforced concrete, and finished with a protective polyurethane sealer and hand rubbed wax. The unique base is finished in black powder coat finish. This is a beautiful modern design, applicable to many different styles. The grey and black tones are very easy to decorate around and easy to correlate with other colors. The Fortis Cosole table by Urbia. One of the more unique designs available in the marketplace today. The Fortis is an amazing harmony of modern and natural elements. The black steel element is finished in a durable powder coat. And the natural Chamcha Wood element is the most amazing end to an absolutely stunning design. Please see the notes below, as you are able to individually select your piece of Chamcha Wood. This piece is so stunning, we feel it's applicable to any room in a home, perfect for an entry hallway, as an alternative to a buffet in a dining room, as an accent table in living room, or even a bedroom. The possibilities of placement for a piece such as this are endless.